Using a truck bed bike rack is a convenient method of transporting your bikes without having to mount them onto a hitch or roof. They range from carrying just one bike to a total of 4 bikes but this would be dependent upon the width of the truck bed. The best truck bed bike rack is the Thule Insta-Gator, which securely hooks to the bike via the front wheel and is compatible with a wide range of bikes. There is a variety of different racks available for your truck bed that can mount to the side rails, between the rails and to the cabin. They can also secure the bike via the wheel, frame and the fork by removing the front wheel. Using a hitch mount bike rack is very popular but unless you have a hitch installed and it is not in use, it may not be suitable. Truck bed bike rack can be installed and removed with ease and does not require the effort of placing the bike on the roof. The bike rack compatibility with your truck bed is one of the most important factors. Before purchasing any of the racks, ensure that you check both the length, width and the mounting. Below is a list of the best truck bed bike racks that are easy to install, require no drilling and can securely carry up to 4 bikes. Thule are market leaders when it comes to roof racks and other accessories. Their truck bed bike rack is a premium example of what is available for transporting your bikes but it is by far the most high quality rack on the market. Although this rack can only accommodate a single bike, there is no reason why you cannot use multiple racks on the bed of your truck. Thule state that you can use 2 racks for tailgates that are 34 inches or greater or 3 racks for tailgates that are 51 inches and greater. Overall, the Thule Insta-Gator is the best truck bed bike rack available with the only drawback being the high price tag. If you are planning on taking up to 4 bikes, the Heiniger truck bed bike rack is the best option. The rack promises not to scratch the paint of your truck and it can easily be removed from the truck bed and be used as a standalone bike rack. Due to the design, it may require some adjustments to make it fit securely. However, once put in place, it will provide a simplistic method of transporting up to 4 bikes. For peace of mind, we strongly recommend investing into some bungee cords to secure them in place even further. Overall, it is a lightweight bike rack for your truck bed that is relatively cheap when you consider the alternatives. The ability to remove it and use it as a standalone bike rack is a unique feature that can be very useful too. The INNO truck bed bike rack is a more affordable option when compared to the Heiniger and Thule alternatives. Unlike the other bike racks, the INNO connects to the truck bed side rails and is a clamp-on installation. The INNO racks is a unique rack and one of the most popular among truck owners. As there is only two side of a truck bed, you are limited to only 2 racks but this may be all that is required. Swagman specialize in racks and bike storage and their bike rack for truck beds is an excellent choice for many. It mounts between the bed rails of your truck and are suitable of carrying 35 LBS. It is worth noting that this rack connects to the fork of the bike, which provide a secure connection. Overall, the Swagman is on the more expensive side of things but it is an excellent all-rounder that is built to last. The telescoping design also means that is compatible with the majority of truck bed sizes too. Pipeline Racks are a relatively small brand when compared to the alternatives but they provide a premium bike rack suitable for 3 bikes. It is worth noting that in order to use this bike rack, you must have at least 58.5 inches of width available at the cab. Overall, the Pipeline Racks is an easy to assemble truck bed bike rack that is great for transporting bikes without clamps or drilling holes. If you will only be transporting 2 bikes, they do have a smaller rack available for 2 bikes at a cheaper price. The Top Line UG2500 is a truck bed bike rack that is suitable for carrying 2 bikes using their patented Uni-Grip system. However, if you have more than 2 bikes, it is fairly easy to affix another bike rack using Top Line’s extension bar. Overall, the Top Line UG2500 is a cheap bike rack for your truck bed that is secure and mounts in a matter of minutes. However, due to the low cost, there may be doubts to whether or not it will be long lasting after heavy usage. Transporting your bike can be achieved in a range of different methods. Due to the length of the truck cabin, using a roof mounted bike rack will not be compatible, which is the reason why mounting a bike rack on the truck bed is much easier. However, not every truck bed is the same as some are longer or wider and many people will also use a truck bed cover. If this is the case, there are adapters that you can get to mount a rack onto the truck bed cover. To help you make an informed buying decision, we have produced the below buying guide regarding truck bed bike racks. One of the most important factors to consider is the number of bikes that the rack can hold. Of course, you will want to be able to hold as many bikes as possible but you will not want to compromise the stability. This can be the issue with many of the larger racks because they may not be as secure. 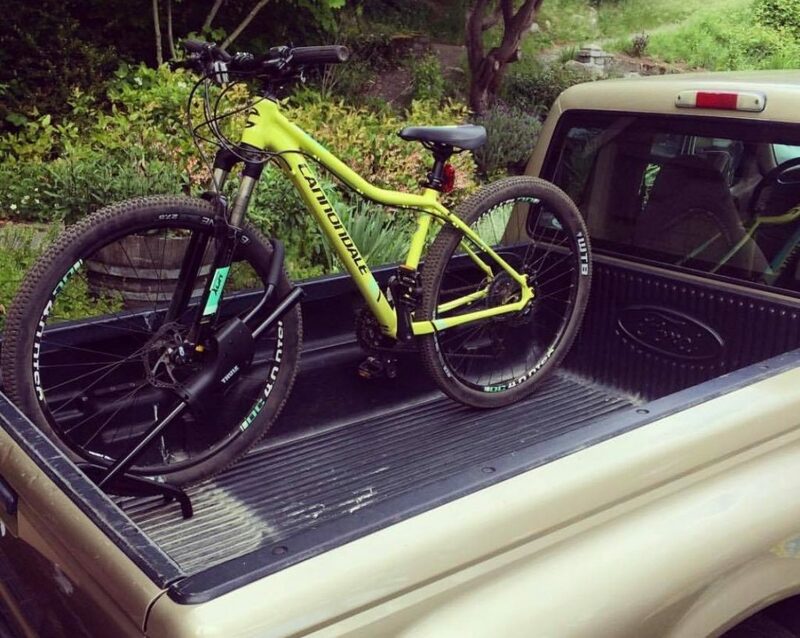 Although some racks are able to hold a one or two bikes, you can use multiple racks on your truck bed for additional bikes. Although every bike rack can be stolen in someway or another, it is advised to make it as difficult as possible. Some of the most secure racks lock onto the rear of your truck, which makes it very difficult to steal the rack. Other provide no security benefits whatsoever and it simply just locks the bike to the rack. Depending upon how determined the criminal is, they will be able to steal even the most secure of bike racks. However making their lives as difficult as possible is highly recommended. You can even add your own padlocks, bungee cords and other straps to help secure and stabilize the bike on the rack. Truck bed racks can also be used elsewhere other than the bed of your truck. For example, the Heininger 2025 Advantage Bed Rack can be used as a standalone bike rack when removed. They can be used to store other heavy objects to prevent them moving around in the truck bed. For example long timbers can be secured within the wheel location of the rack. For those that own a truck, this type of bike rack is a must for transporting bikes. As you can see from the benefits above, they have a lot to offer. Investing into a quality bike rack for your truck bed can be highly beneficial for transporting your bikes securely. There are several different varieties that allow you to mount your bike in a range of different methods that include with or without the front wheel. All of our recommendations cover rack that are capable of carrying up to 4 bikes and suited to a range of budgets. Purchasing racks from reputable brands is highly recommended as they would have been tried and tested a lot further than the cheaper alternatives.